Representing the latest thinking in this fast-moving and often emotive field, this book offers a remarkably comprehensive international coverage of the public aspects of archaeology. The process of survey and inventory, rescue and archaeology, conservation and protection have until now been studied largely on the basis of individual countries and their administrative and legislative structures. 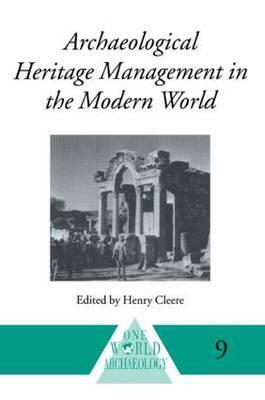 Now, by virtue of its broad geographical coverage, this volume provides many rights and guidelines not hitherto brought into focus: the history and philosophy of archaeological heritage management, case studies (regional, national and specialised), and the training and qualification of archaeologists for heritage management. This book is essential reading for all students, researchers and practitioners concerned with archaeological heritage management, public administration and the legal community whose work involves archaeological issues.